Mia Roman is a mother, daughter, sister, part-time entrepreneur and works for an investment bank. What makes Mia unique is her love and commitment to art from a Latina’s perspective. Born in New York to Puerto Rican parents, Mia has displayed her art throughout the east coast including New Jersey, Pennsylvania, and Florida. Her work as been published in several books including: El boricua, Sofrito for your Soul, ABLA and Boricuation.com, just to name a few. Vida: So Mia, how did you get into art? Mia: I was raised in a very creative environment where music and art was a daily occurrence in our home. Growing up, I expressed my creative energy in many ways, arts & crafts, clothing, hair, makeup, jewelry making and designing items of all sorts. I would shop in vintage shops and find items I could use for art & craft projects. I also found clothing I could wear that would be out of the ordinary, including things I could decorate with. And the jewelry, oh the jewelry! I would wear at least 8-10 bracelets on each arm, big bold earrings, chunky and vintage metal necklaces, all this even before it was a fad. While attending Fashion Industries High School in NYC (New York City) my classmates would call me “Add-on Mia” because I would add things on without fear. I would wear 2 skirts at once, funky tights, boots, vests and always the jewelry! I found myself being the blank canvas to my unlimited creativity. I was my best tool and my creativity was the instrument that put the tool to work. 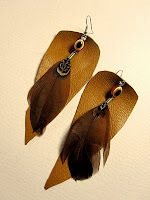 Over the years I started to experiment with many mediums, wood, fabric, metal, plastic, food, paper and paint. I found that I could write my feelings then paint them. I was able to become an advocate for my culture, family and history using color and form and a newfound love with paint. I painted everything I could get my hands on, I sketched on the train, bus and silently while in my studio. The one thing about art and creativity for me is that it comes from a deep loving heartfelt place that feels like rain on a hot summer day, or the sun on my face on a breezy day or the first snowfall of the winter, the first autumn leaf as it drops from the tree branch that held it for so long. I am deeply inspired by Frida Kahlo, Diego Rivera, Orozco, Picasso, Tufino and so many more. I found that I could sit and channel the energy of such wonderful artists and be inspired to work. While traveling throughout Europe and the Caribbean I was able to see such wonders like the Mona Lisa, Michael Angelo’s David, Winged Victory, Pompeii, The Ruins in Mexico and of course Frida Kahlo’s Casa Azul. All of these prized pieces of history inspire me. Music feeds my soul too, it is the root of me and it is what sparks the fire to the flame of my creative spirit. The rhythms of music were always heard in the house, like the heartbeat to ones soul. It’s there in full beauty, feeding us, speaking to us, loving us. Vida: When did you get your first big break? Mia: Big break? Haha, well I’m not sure if I can call it a “big break” yet. What I can say is that I have been blessed with many opportunities that have lead to many wonderful and unforgettable events, which have inspired me to become a curator, mixed media artist, businesswoman, writer and free spirit. Some of the organizations that have embraced everything about me including my madness, are the Clemente Soto Velez Cultural and Educational Center in NYC, The Nuyorican Poets Café, Boricuation, The Children’s Art Carnival, Carib, 100 Hispanic Women, Latino Flavored Productions, OP Art, ABLA, The Urban Individualists and so many more. They are the village that fed me spiritually, emotionally and creatively. With the foundation being my family I can stand strong and confidently. Vida: Could you tell us a little bit about who is Mia Roman? 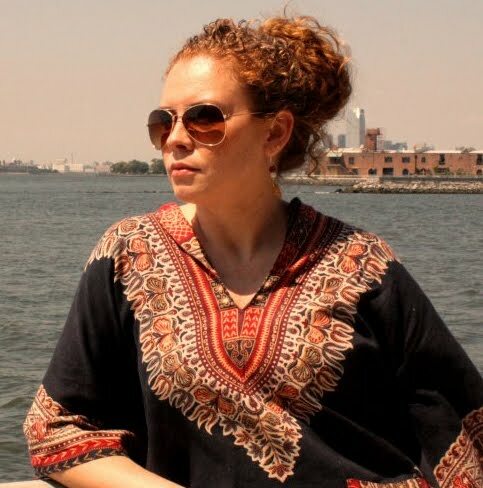 Mia: I am a “Nuyorican” born and raised in Brooklyn, New York to Puerto Rican parents. I say, “I AM BROOKLYN, BROOKLYN I AM” but with my heart belonging to the island of Puerto Rico. I attended the local public school and middle schools and was the unforgettable bright red headed hippie child that ran faster than the boys and played with dolls - a tomboy with a feminine streak. In high school, I majored in Window Display and Fashion Merchandising where I learned all about the fashion industry and retail field. I took a job at Macy’s as a salesperson and became a merchandising apprentice and was given creative freedom to design displays throughout the store in Herald Square. I was bitten by the creative bug once again and took it all the way. Nothing was safe in my hands! 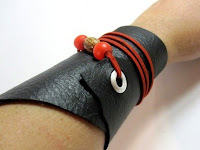 I cut it, sewed it, glued it, shaped it and molded it into things that even astonished me. I went on to college to study Business Management and Administration with the hopes of one day having my own business. That dream and hope never left and is just becoming a reality. I am most inspired by my Mother, who showed me that you can use your creativity, intelligence and determination to achieve anything and everything in life. As a Latina businesswoman herself, she has overcome obstacles and proven that adversity can be overcome. With that said I take and run with her advice. My direction is forward and my suit of armor is a smile and open mind, all else will fall into place with hard work and diligence. It was my ultimate goal and dream to be a Mommy to a Daughter and I did it, all else is extra. Ever since I was a small girl I wanted a daughter. I played with dolls into my teens. I would dress them up, play with them, have parties for them, shop for them and just got crazy for dolls. Things have not changed I have an extensive collection of all sorts of dolls from around the world. My Daughter is my rock and everything I live and breath for. She is my flight and air, my new day, the future and the light. My life is a "Sabroso Sancocho" con sabor! I would not trade it for the world. Vida: What are you doing while you launch your business? Mia: Today, I work fulltime at a small financial boutique firm in NYC where I work in Mergers & Acquisitions for Investment Banking. I have my own small business of Wearable Art. I am also a curator, educator, painter, creative writer and proud mother to a College student. I teach part time at the Children’s Art Carnival in NYC and the students are young, fresh and eager to soak up everything I have to offer. They are all me as I am them. I am a giver with so much to offer and should life give me more than I have today I am eternally grateful. All I have to say is, stay close, keep posted and check in from time to time, because you never know what I will come up with next. Vida: How do you balance your business and personal life? Mia: I am very fortunate to be able to utilize both sides of my brain while learning and growing. You ask how I balance my art life and my personal life? I don’t see it that way. I see it as one life, one person, my life with different days, different directions and sometimes it balances out and sometimes it doesn’t. But with the support of my family, I can see it through and overcome anything no matter what I am given or presented. I hold my head high y Palante voy yo! There have been many obstacles and what I call “life adventures” and “adversities” that could have derailed my growth at any point. There were people that I trusted and loved that were nothing but “solid brick buildings” standing in my way, waiting for me to fail. But, it was my Mother who taught me how to fight the battles and win the wars. She showed me my strength and how to use it, dig deep and find it, and never to be afraid to show it. I have a strong bond with my younger brother and sister, and Mom taught us to live, love and celebrate life everyday despite of what may get in our way. And, those nameless “buildings” have become lost and empty souls. Vida: Tell us about your art. Mia: I love to paint women. Not any woman in particular, but the women that I see in my heart, and they are all me in one-way or another. 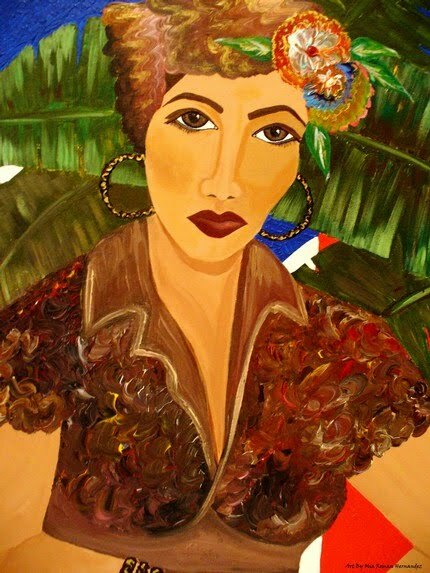 My most prized pieces are “The Mona Mia” which is from the Hermana Series and has gained lots of attention and for which I am also known, and, “La Borinquena” from my Cultural Woman Series. 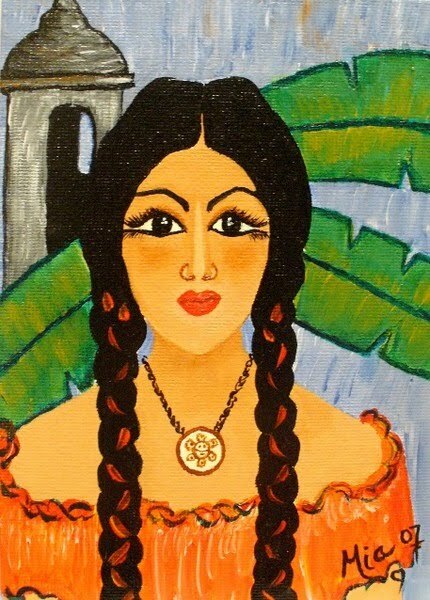 The colors of “The Mona Mia” are soft, warm and welcoming, with her two braids hanging long over her bust, her face slightly tilted to the side, her eyes looking at you softly, and her blouse off her shoulders. She’s sensually simple. My other proud piece, “La Borinquena,” sits upright, proud, with the banana leaves and her flag in the background, telling a story with her eyes and facial expression. Donning a headscarf she is culture, pride and confidence. She is me, check her out you’ll see that, if you know me. The pieces are all inspired by the women in my family, the women I meet in my travels, women I read about and women I admire, powerful, confident, empowered, independent fighter, advocate, lover, friend and mother. The pieces that get most of the attention from my collection of paintings are the cultural folk art ones. The ones of the Women sitting stoically with a stare, people say that the eyes in my paintings are unique, that they look as if the painting is looking right at you, as if the eyes are the story. I say that “the eyes are the souls and if you look into them you feel the story”. I love folk art and folk art is what inspires me. I love the cultural history about folk art and I think this is why my work reflects this. Vida: Where can people get more information about your artwork? Mia: Some of my original paintings can be viewed on line at www.artbymia.etsy.com where you will be able to view and purchase originals and prints. I am easily accessible via email for any inquires at artbymamamia@yahoo.com. I am currently working on a few shows for the fall to take place in and out of the NYC area. Should anyone want to be added to my mailing list they can email me the request or join my “Mia in The NEWZ Letter” on my website. Vida: Is there anything else you’d like to share with the readers? Mia: I would like to close the interview by saying thank you Adrian and thank you to all those who support me and love me. It is with your support, love and energy that I am able to continue forward with my passion. Life is Art and Art is Life. Amor Siempre!